The Frame class in C# and the <Frame> element in XAML represent a Frame windows control at run-time and design-time respectively. 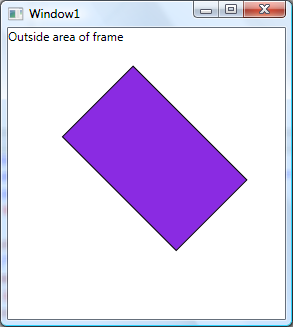 The code examples in this article demonstrate how to use a Frame control in a WPF app using XAML and C#. The WPF Frame control using XAML and C# supports content navigation within content. A Frame can be hosted within a Window, NavigationWindow, Page, UserControl, or a FlowDocument control. This XAML code shows how to create a Frame control and sets its Source property to load a XAML page within it. The Window looks like this. 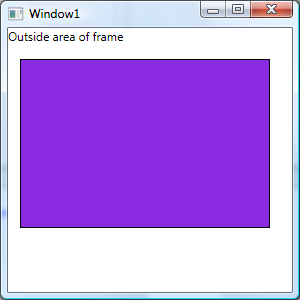 The Purple area is the Page1.xaml and the White area is outside of the frame. Now you can manage the contents of a frame the way you want. For example, the following code rotates the contents of the frame to a 45 degree angle. The new output looks like this. The following code creates a Frame within a window and adds a button control to the window. On the button click event handler we will navigate to a URI using a Frame. The Navigate method of Frame is used to navigate to a URI. The following code navigates to Page1.xaml. The following code navigates to an external website URL and opens the ASPX page within a Frame. If you need to open a URI in a new browser window, the following code will do that. This code first creates a NavigationWindow and then sets its Source to a URI.